It hurts, looks rubbish and is a burning reminder of the real risk of skin cancer all of us face from the sun. Skin cancer kills more surfers than drowning. Maybe we should be worrying more about the UVA & UVB properties of our creams, than how long we can hold our breath..
Sun burn & sun stroke can ruin your trip, make you unwell and kill you in the long term. Over the last decade surfers are getting wise to the risks. Its common to see suncream in the car park in the summer, and long sleeve rashies with hats on the boat trips. Some people claim that they ‘never burn’. Good for them. I burn. That doesn’t mean that they’re immune to skin cancer, and there’s a strong argument that fair skinned people who take good precautions are at less risk than a darker skinned person who doesn’t. Two-fifths of people (40%) say they burn their skin in the sun on purpose to ‘deepen’ a tan, according to new research by Macmillan Cancer Support. This is despite the fact that getting a painful sunburn just once every two years can triple the risk of skin cancer. You can read more about their research here. If you’re British you’re probably more used to dealing with hypothermia than sun burn. According to Macmillan 25% of us think that we need to burn inorder to tan!!! Some people argue that going on a sun bed a few times prior to a trip gets your skin warmed up (‘base tan’) and ready to deal with scorching sun all day for a couple of weeks. I haven’t been able to find any evidence that this works so I can’t recommend it. UV rash vests. Think about the arm length, neck cut and how well it fits around the waist. I always forget to put cream on the base of my back before a surf. Hats. They work really well to keep the sun off your face and neck. The designs have improved and its starting to be accepted that you don’t have to be a knob, or a ripper to wear them..
Sun Block. Everyone has their favourite products. Slap it on. Try and use UVA & UVB. Give it time to soak in before you go in. The stronger the better. Remember that spf declines as the product ages so check the use by dates. Zinc cream. Highest spf available. Bright colours. Makes you feel like a kid putting on face paint. Put it all over the bits that stick out of your face! Lip Balm. An often forgot about bit of skin. Commonly burnt and very prone to skin cancer. Apply lippy! Some people try and avoid the midday sun. I don’t, I’m there to surf so I just make sure I’m covered up and lubed up with sun cream. Ireland can offer some shade from the sun too. Australians are largely descend from cooler climates, and are now living now under tropical strength sun. They have a high rate of skin cancer as a result. In response to this they are streets ahead the rest of the rest of us in getting the message across about being sensible in the sun. Its working and their incidence of skin cancer is falling. Know what product to use, where and how often. 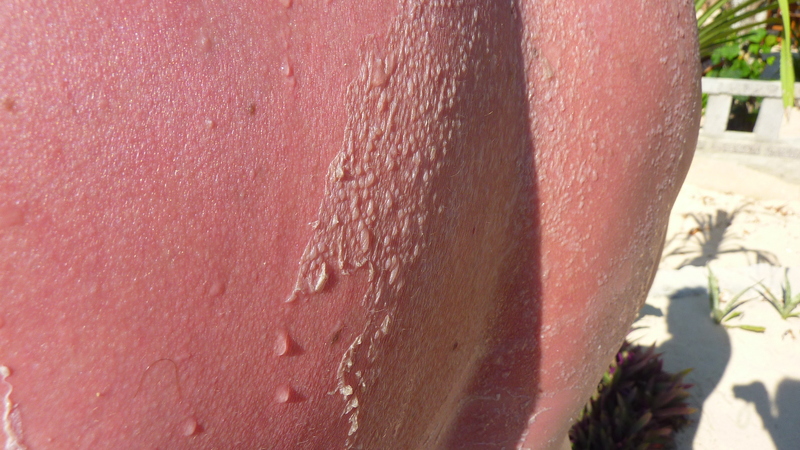 This really is the key to reducing the risk of sun burn and problems associated with it. There’s a lot to learn. I really recommend reading two detailed articles published by Surfline about sun burn & sun cream. These articles are so comprehensive that we’re not going to elaborate on sun cream further. We’ve also found a website that claims to have reviewed every sun screen product available. Worth a look if you’re deciding what to buy. Just make sure you lube up! UV radiation goes into wet skin better than dry. Most (65%) of UV radiation in the day hits between 10am & 2pm. If you’re brown and you don’t use cream you’re still at risk of premature skin aging and skin cancer. You should be up to date with your tetanus boosters before you go anywhere. Anti-mozzie properties in sun cream can really knacker reef ecosystems by killing of the small invertebrates. It only takes a couple of people wearing it to have an impact. Different ways to get out of the sun. Some harder than others. There can be a delay. Blisters. These can take a few days to develop. From severe or prolonged exposure. This is worsened by dehydration and can be a medical emergency. Once you’re burnt you’re screwed. You’d be a fool to keep going out in the sun. That means less waves so make sure you prevent it happening. Keep hydrated with clean water. Try not to get smashed on the local booze. Ibubrofen works well for reducing the discomfort. 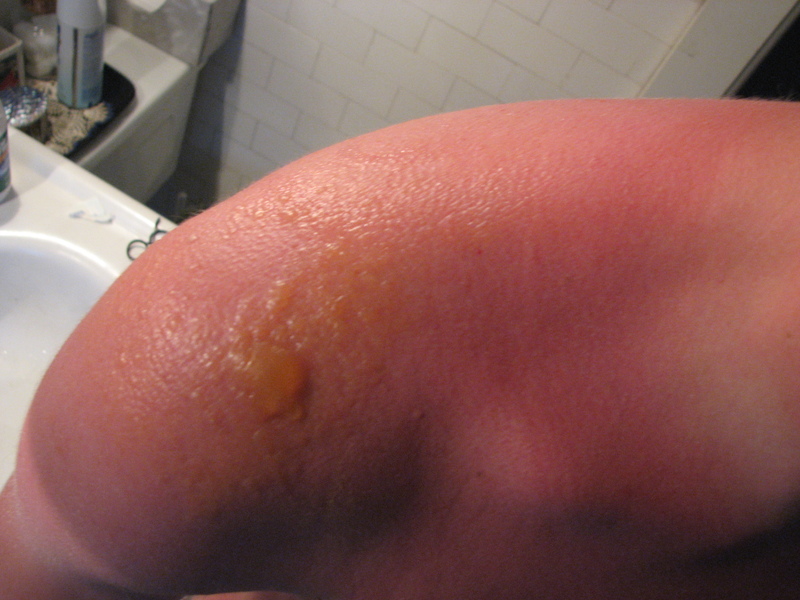 Putting ibubrofen gel onto burns is claimed to help the pain and reduce the reaction. These claims however are made by the companies that make the gel. Apply cool clean water. Do this for about 20minutes. Not too cold as you can burn the skin further (cold burns). Do this at least 4 times a day. Ice packs (that are clean) have good evidence but again make sure you don’t burn the skin. Repeat 4 times a day. Do not break blisters. They act as a barrier to infection. Antibiotic cream should only be used on severe blisters. Avoid oil based creams early. These can exacerbate the damage. Try keeping damp clean cloths on the area. Moisturisers (non-perfumed) once the initial burn has died down help prevent the skin drying and cracking. HOW DO I HELP IT HEAL? If you have any concerns about your health or the normal function of the area of body that is burnt. The sun burn appears to be deep. Try pressing the area. The colour should disappear and then return. If this doesn’t happen (doesn’t disappear) then its deep. If its white its deep. Deep burns aren’t to be messed with. They can kill. If you have bad burns all the way around your neck you should consider going to hospital. Keep the burns moist to prevent constriction. Click to visit http://www.skincancer.org/ for useful information. History of lots of time in the sun, even if sun cream was used. Its really really common. Not having any of the above risk factors doesn’t mean you can’t have it. I was going to write a bit about the different types of skin cancer, but I’ve decided not to. If you’re go any dodgy looking moles, freckles, skin discolourations or itches you should go to a doctor to have them looked at. Early diagnosis and treatment is the key to make it a curable, not fatal illness. Remember to cover up, keep hydrated and use loads of high SPF sun cream.